Rugged wrought iron side handles perch astride this prominent basket. The elegant black and natural contrast, cathead bottom, and extensive detail attract interest. The bottom trim is made up of a row of cross-stitching of dyed wicker, doubled for effect. Woven on a wooden base with a few rows of color to personalize. Silverware or Mail is oval, 9" x 11" x 3 1/2" tall. 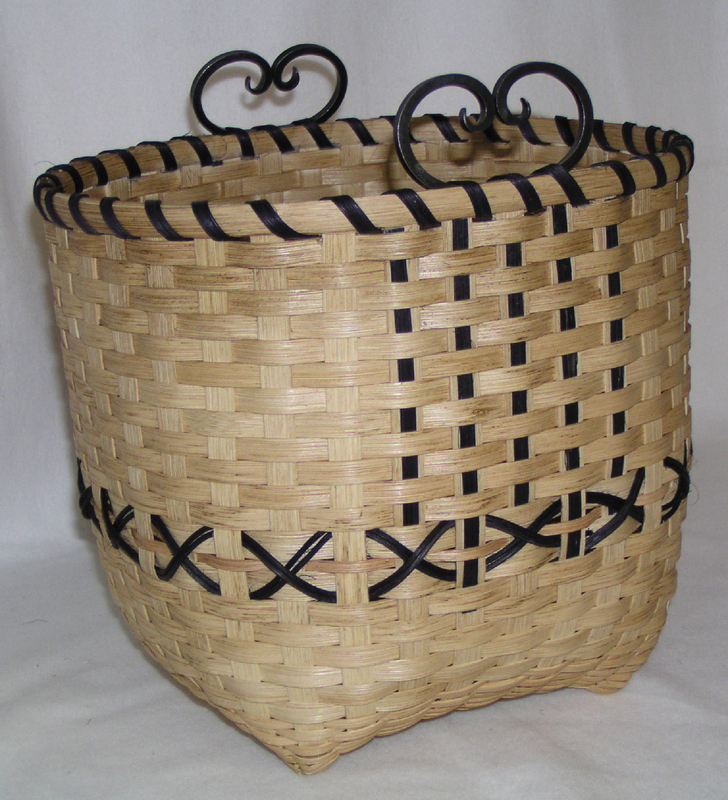 This basket is constructed with 5/8” flat reed, #3 round reed and rope for the rim and handles. It was inspired by a factory produced basket we saw at a cabin on Shallow Lake. The entire basket is twined. 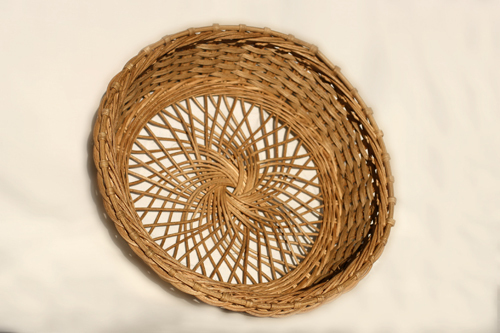 In this workshop you'll learn the traditional basketry technique coiling. The basis of this basket is an irregular shaped gourd shard, which has holes drilled prepared for your stitching. Pine needles will be ready for you to begin stitching around the shard. You'll be using waxed linen as the stitching fiber. 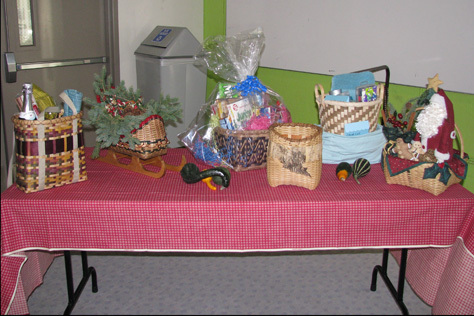 Discussion will include gathering and preparation of pine needles, a simplistic stitch for coiling pine needles, shaping, and ending a coiled basket. All materials will be furnished for this class. You'll need to bring a small sharp scissors. Size varies – approximately 5”. It makes a great little Easter Basket, but in the "off season" you could use it for a multitude of items. Bathroom vanity items, top of the dresser, notecards, your weaving tools, silverware or napkins going to the picnic table, the coffee table clutter ( remotes!!!). You name it!! Color choices will be available. Let me know if you are looking for a specific color. 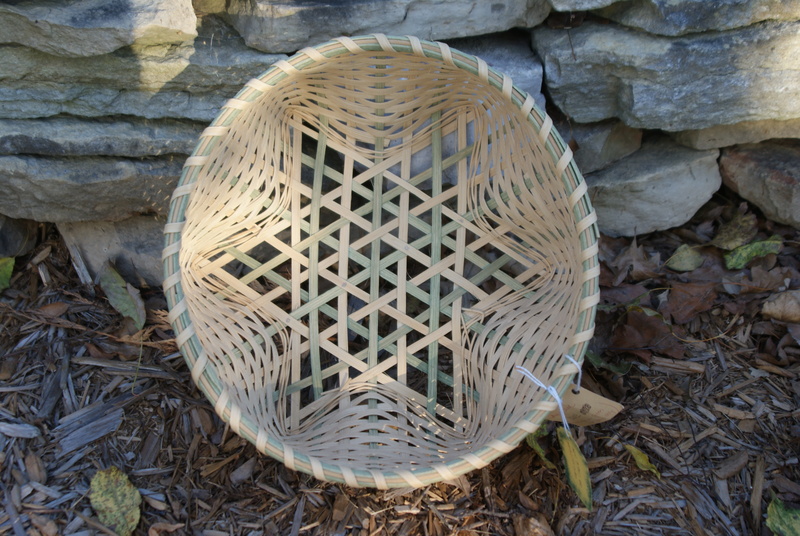 This basket is woven with two colors of reed that create the Star of David on the bottom, becoming a circle at the top. 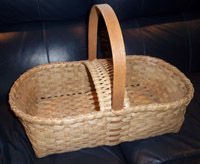 This is a great basket for learning how to interweave reed. 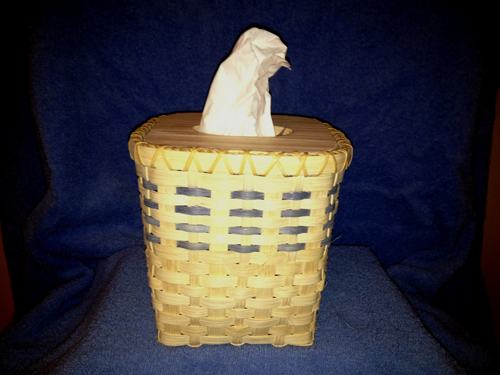 This basket is 6”x 6”x 6” tall, and holds one box of Kleenex. It has a wooden top with a hole in the middle. It is made with ¼" flat reed and 1/2 flat reed. You have a choice of brown or green Japanese cane for accent colors. It begins with a round oak base and ends with an oak handle. You will be learning shaping and how to keep the same diameter all the way to the top and how to create the arrow pattern. One color choice as pictured. Pattern written by Diane Gotham. Start with 6 sets of weaver to weave the round reed pin wheel base. You will learn the balanced 2/2 twining, along with a 4-rod wale footer. Flat oval reed is inserted between the side spokes. All spokes are used to form this unique rim. Shaping the base and the rim will be the challenges in this basket. This is a paper basket with style and technique. Start with an open weave base secured with a twining material that becomes part of the design of the basket. Learn to weave diagonal corners, and weave shoulders and overlays. Finally, learn to create the flaps which are turned and secured to the basket with coordinated beads. 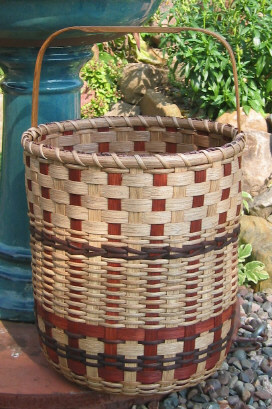 You can also firm up your basket using a water-based varnish technique. Sharp side cutter, tapestry needle. 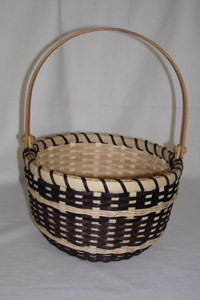 Eric Taylor has been making baskets since 1984 and has taught the art of basketry, nationally, for twenty years. 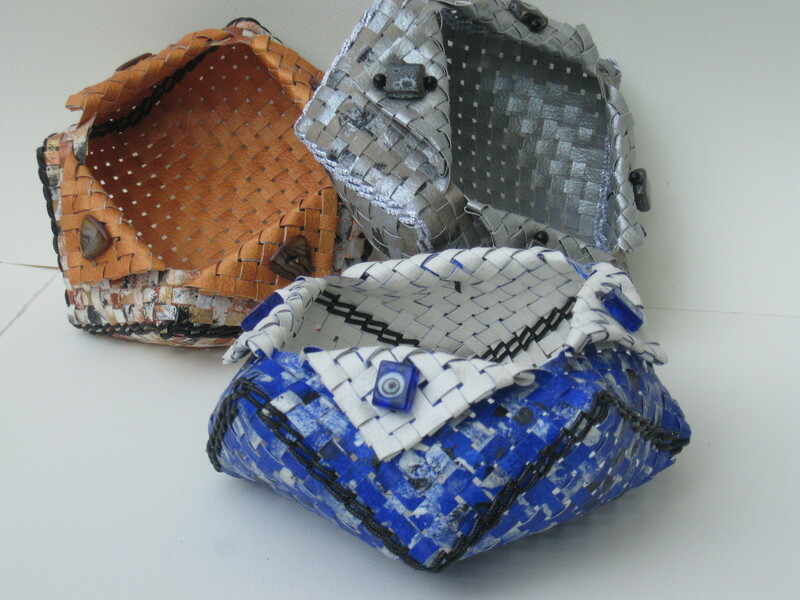 He travels across the country teaching his designs at basket making conventions, guilds and private classes. He brings with him an array of tools and equipment for his workshops, including molds and materials. He has successfully taught beginners and prides himself in the completion of each student's baskets. Choose 2 sizes of hoop sets: 5" & 7". One set will be made in class. One set can be taken home (along with ribs) and woven at your leisure. Natural and smoked flat reed will be provided. Learn how to weave the braided god's eyes, ALL about rib placement and how to use sea grass for fill-in. Basket can have open grab space on one or both sides. ONE large clamp and one small and one large packing tool. 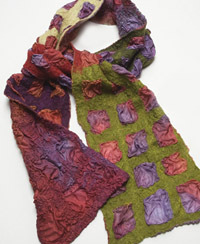 Dye your own silk scarves in the morning, then design a nuno felted scarf in the afternoon. Learn color theory and silk dyeing basics, safety tips and eco-friendly dyeing methods. After a short “setting” period, your silk will be beautifully dyed and ready for an afternoon of felting. With your dyed silk as a base, apply soft wool and other exotic fibers to the surface and learn the steps to bond them into a beautiful nuno felted scarf. Dress for mess and be ready to roll up your sleeves. Fee includes 3 silk scarves, all fibers and supplies. Bring from home: Sharp scissors, 2-3 old hand towels, 1 old bath towel, plastic bag to carry home wet items Optional: apron Pattern written by Diane Gotham. The 14th annual Basket Bingo Fundraiser. Play bingo and win baskets! Come and enjoy fun door prizes, food and a raffle. Bring your friends and family, this event is always a lot of fun! Don't miss it! $10.00 for a set of cards, additional cards available. This style of basket was used to carry food to church on Holy Saturday to be blessed for the Easter Sunday meal. The divider across the center of the basket is to support the embroidered linen cloth used to cover the food. 4. Pattern owner credit: Jeanette Biederman who credits Grace Kabel with the idea for this basket.